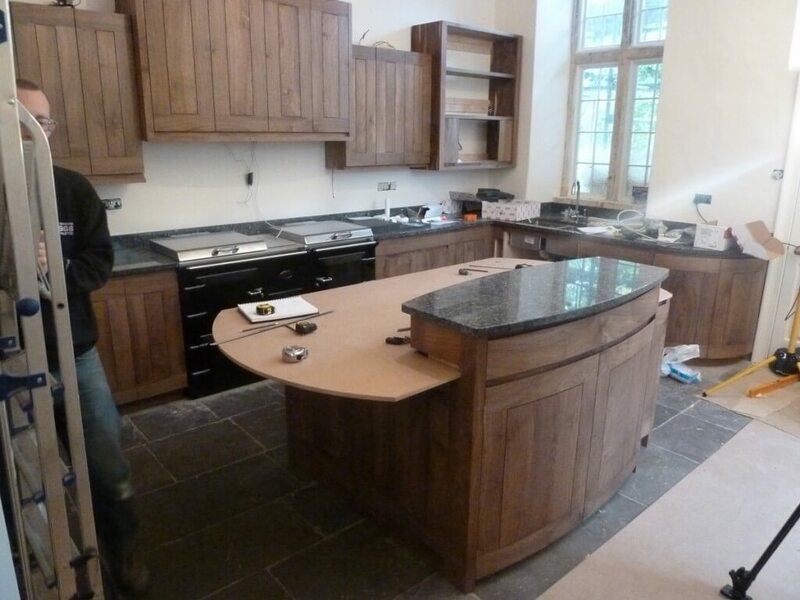 Do we enjoy fitting work – no not really. Ask any cabinet makers and they are always more comfortable in their own workshop with the tools and equipment they are familiar with, there is always something we have forgotten no matter how small, or a tool that would be perfect for a job we didn’t anticipate. Saying all that, over the years we have got good at it and frankly we wouldn’t trust any one else to fit the cabinet work we have spent months making. It’s really not the same as a set of Howdens units, we work to very fine tolerences, even if the walls and floors seem to be working against us. On this fit the walls and floors got a 9 out of 10 in terms of awkwardness, with the small easy jobs ending up taking lots of time, while those bits you expect to be difficult turning out to be easy. For example John and I spent about 7 hours getting a fridge door to work, that’s half a day out of a 4 day fit on one door! For all the issues we encountered we still finished ahead of schedule on the last day and got everything done we expected. There are still some pieces to finish – the island sycamore top (i’m now making the second one after three trips to the timber yard), the cornices for the top units, the free-standing bin unit and some miscellanious items are still to come in a few weeks. It looks great already though, the clients are very happy and can at least start using the space. 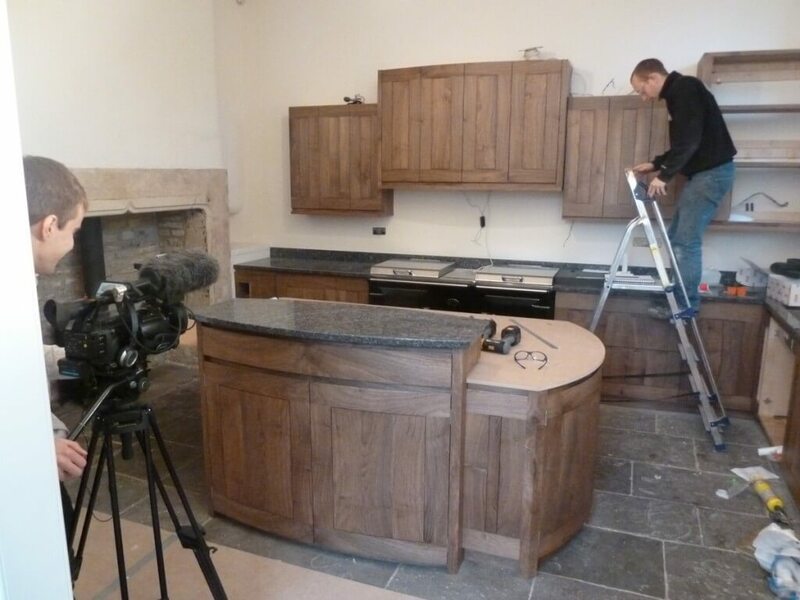 To complicate matters for ourselves we had the Watershed PR film crew in on the last day of fitting. We have been following the making of this project through all the stages. Eventually the film will be here on the blog for you viewing pleasure, as will finished professional shots in another of our major project ‘Case Studies’. 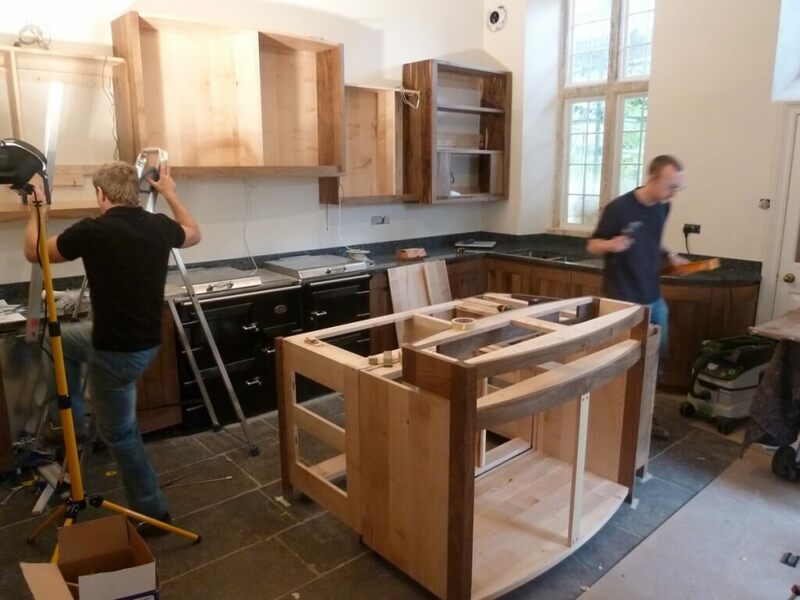 Hopefully these images will give you a taste of what’s to come of this really special English walnut and sycamore kitchen.